We got a reasonable snowfall last night. 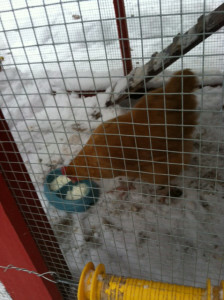 I had to dig out the run a little, and still they are very freaked out that it looks different. Luckily, they were finally lured out by the morning’s offering of yogurt. (Garden Guys returns to the air after New Year’s, so there will be new Too Many Chickens! episodes then). 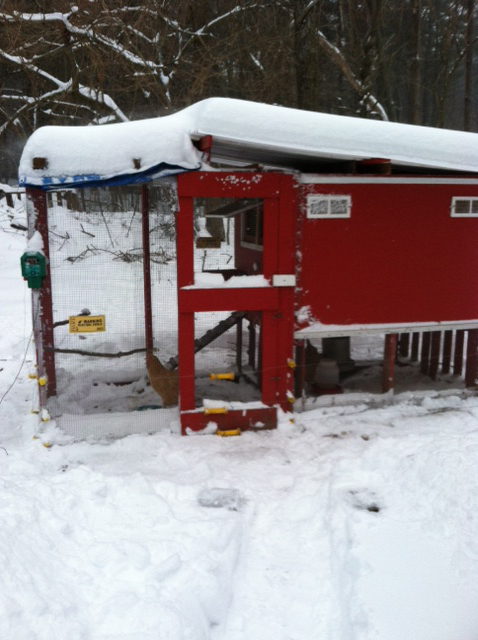 This entry was posted on Sunday, December 15th, 2013 at 3:12 pm	and is filed under Backyard chickens, Chickens, Snow, Winter. You can follow any responses to this entry through the RSS 2.0 feed. You can leave a response, or trackback from your own site. This page took 0.199 seconds of computer labor to produce.